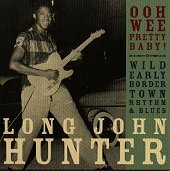 In Music We Trust - Long John Hunter: Ooh Wee Pretty Baby! From El Paso, Texas comes Long John Hunter, a bluesy-rock guitarist who can also sing. Recording exclusively for the Yucca label while playing at the Lobby, until 1971 when the owner of the Lobby became ill and had to shut down the club, Long John Hunter recorded some amazing R&B/rock music that is now being re-issued as one album, OOH WEE PRETTY BABY!, on Norton Records. Every one of the twenty-one tracks on this album are steamy, passionate, and full of energy. Simply put, they're amazing blues-rock music with plenty of rhythm and grooves to boot. Going back to the days when rock 'n' roll was pure, real, and just plain fun, Long John Hunter's music seems to fit in and embody that concept perfectly. "Ride With Me Baby" showcases his stellar guitar playing, with the blues running through his fingers, and rock 'n' roll running through the entire bands' mind. You can't seem to stop them as they dive through greasy, sweaty, dirty blues-rock music that make your jaw drop and hips move. "Hey Mrs. Jones" provides plenty of dance moves with its wild, spirited rock 'n' roll pulse while "The Scratch" steams things up a bit with some smokey blues. "School Girl" gets you dancing with R&B/Rock and "Old Red" gets you shaking and simmering; but "Betty Lou" gets you sweating from the heat with its deep, blistering horns and tremendous rhythms. Here is a standout rock 'n' roll album that shows how it is done. Though it may be from the sixties and early seventies, it feels like its alive and breathing fresh air (which it is) when you're blasting it out of your stereo. Come on down, dance, and remember when rock was about fun. I'll give it an A.